These cookies are great to make when you want something sweet but are short on time. 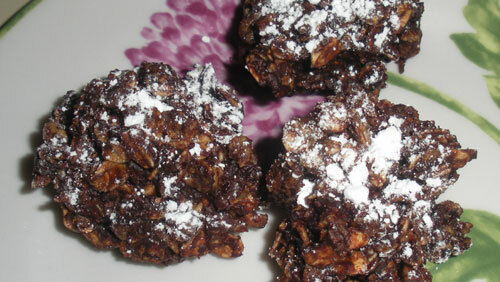 They also have lots of oatmeal and cocoa in them: good-for-you ingredients. 1) Melt Smart Balance in large kettle on medium heat. Stir in cocoa, milk and sugar. Bring to a boil and boil one minute. 2) Remove from heat. Add the rest of the ingredients and stir. 4) Sprinkle with confectioner’s sugar, if desired. 5) Allow to cool about an hour. Cookies will harden as they cool. Then eat!